The Foundation Award is presented annually to a non-competing member(s) of Team NRGY to recognize tireless and selfless contributions to Team NRGY. Their support, energy and passion provides significant impact on Team NRGY and enables their loved one and all members of the team to excel and achieve their personal goals. This year’s award goes to Michael and Kathleen Santarcangelo, my parents who have enabled me to excel and achieve my personal goals, and in turn have enabled this team to achieve its goals. These two individuals represent the foundation of Team NRGY. Their encouragement, support and unconditional love provided me with the inspiration to start Team NRGY. The very idea for Team NRGY took shape after completion of my second Ironman. While relaxing on the porch over looking mirror lake, they encouraged me to become a coach and to start a team so I could enable others to experience the same sense of fulfillment and accomplishment I felt and continue to feel competing as a triathlete. My dad selected the name and together they vetted the Team NRGY colors as they wanted to in their words “be able to see us coming a mile away” and of course, we know that Carolyn achieved that. Thank you, Carolyn. My parents edited the website and all of you know that they braved the torrential rains and cold temperatures to be there for our very first event as Team NRGY, the NJ Marathon and Long Beach Half. Mom donned the Team NRGY colors and ran a half marathon and Dad manned the tent or rather held down the tent so that the wind didn’t blow it away. Sure it was rainy and cold but they were right there by our side making sure we had everything we needed to be successful. Nothing can or will prevent Kathleen and Michael from always supporting each of us and ensuring this team’s success.Their words of encouragement and their selfless acts have inspired many. The Lambert family who will be competing in the Myrtle Beach Marathon in February as a result of conversations with my parents after Ironman Lake Placid. As many of you now realize, we are gathered together this evening in celebration of the creation of Team NRGY. The Foundation of the our team is Kathleen and Michael. Again, I would like to extend a very special thank you to my parents for believing, caring and supporting my dreams and those of Team NRGY. I cannot personally thank you enough. Mom and Dad, it is my honor and privilege to award you both with the first Team NRGY Foundation Award for your tireless and selfless contributions enabling us to excel and achieve our personal goals. Hi everyone, my name is Andrew Clark (Clarky) & I have come to know alot of you over the last year via Team NRGY. I'm the Aussie member of the team. I got into the sport because I work at the same place as another NRGY member - Ken. Ken heard that I liked to ride my bike & had participated in a company bike race & therefore started to pester me about doing triathlons. Being a very competitive person I decided to give it a go & said "yes I will do a race." I entered my first race as a 1/2 Ironman at Timberman in New Hampshire not even knowing where this was or being able to locate it on a map. One cold winter's day last year I went home & told my fiancée that I was going to compete in a triathlon & had signed up for a 1/2 distance Ironman race in another state...and by the way "I have joined a triathlon team called NRGY based in Montclair." Doesn’t this story sound familiar?Bethany - who was busy in a new job at a new company & preparing for our wedding at the time - was very supportive & said "that would be great...you'll be good at it.” Doesn’t this story sound familiar? Over the next few months I started to train more & more in preparation for my race. I'd wake up very early (most mornings at 4:15am to leave to get to Montclair by 5:15am) & although I tried not disturb her before leaving the house to go for a bike ride I knew she opened her eyes and somehow lost a few more minutes of sleep. Other mornings I'd set up the bike machine in the living room & spin for an hour or so. We are here from our native Australia and soaking in the culture - so imagine the sacrifice when I would come home from a long day at work and I'd tell her we couldn't go out to restaurants because I had to do sit ups or weights..or even go for an occasional swim at the Montclair YMCA (where I'm an unofficial member). Doesn’t this story sound familiar? I love to bike and my weekend morning and sometimes a little more were consumed with 3-6 rides. Triathlons have consumed my life and hers. Every step of the way my wife has been supportive rescheduling our together activities around training sessions. Without Bethany’s support, energy & the passion she showed towards me & the sport , I would not have been able to achieve my personal goals. But I knew this as that's why I love her & married her. Doesn’t this story sound familiar? We all have become successful because of our loved ones and without their indispensable support our athletic goals would not be possible. Just as Bethany was learning to adjust to my new sporting life, Bethany quickly threw herself in Team NRGY Support Person. A lot of you have gotten to know Bethany really well over the last 6 or so months & realized she is also happy to support the team. Pregnant she came to Timberman, stuck close to Tracey & Deb and was all over the course. She was always there smiling. Ringing a cowbell. Taking a Picture. Grabbing Dry Clothes. I think she learned quickly that being a support person is harder than competing. This year’s Foundation award goes to Lenore Imhoff, the consummate friend to everyone on Team NRGY. Lenore embodies the Foundation award as she continuously and selflessly gives to everyone on Team NRGY. Lenore is the first one to share a caring word and a friendly thought. She is always first in line to help any of us as individuals or the entire team. Lenore has given countless swim lessons, in fact, she helped Payton learn to swim three years ago. Lenore is not only an amazing cyclist, but is a tremendous coach. Who in this room has not received a cycling tip from her?Lenore often sacrifices her personal goals for the betterment of Team NRGY. I fondly remember Lenore pacing me through many swim workouts; although she has drafted off me on the bike. Even though she went screaming by me on the bike at the end of my pickup, she knew I would respond. Yep, Lenore asked me for one more gear, one more minute until I reached my maximum. Lenore is always inspiring each of us to look in the mirror and dig deeper to become better athletes and citizens. Lenore leads by example. She has always made sure each of us has everything we need to be successful. In fact, this July, just days before Ironman Lake Placid, Lenore received a call from Jill who had crashed and damaged her bike. Lenore responded quickly by lending Jill a bike, arranging a bike fit, and reassuring Jill that everything would be all right. Everything was more than all right. In fact, everything at Ironman Lake Placid was perfect as Jill beamed from ear to ear this past July, thank in no small part to Lenore. Lenore is a mentor to each of us. She openly shares stories of her life experiences so we can remember what is most important; family and the opportunity to share with our loved ones, our passion for fitness, and our pursuit of healthy competition. Lenore, on behalf of Team NRGY, thank you for everything you have done to enrich each of our lives, empowering us to achieve our dreams. 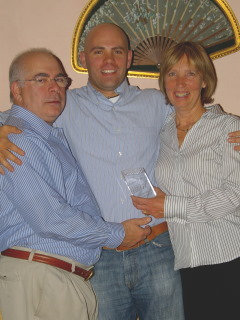 It is my privilege and honor to present Lenore Imhoff with the 2011 Team NRGY Foundation award. We are dedicated, determined and tenacious warriors. We are methodical, data-driven, heart rate zone monitoring, result-oriented geeks. Being submerged in a group of triathletes in training, is not easy. The bitching, the moaning and lamenting can be taxing at times to hear. And that's before the workout has even started. You all know you what I am talking about.Once the work is done, and the muscle fatigue sets in, and you've maybe considered dying to be a good option, a Diva appears. You might think she has wings because she knows just when to appear, how to listen and how to support us. The Diva has hands of magic and supportive words. There does not seem to be a stage she cannot handle. She listen’s to all of us strategize, vent and fret. The she reminds us we do this for fun, that we are ready and we will be awesome. If we need it, a smoothing hand is offered. At NRGY events and races, the Diva is often the first to rise and last to rest. We think she rests when we are out training – but that’s her secret. She captures every detail of the event - she loves using the new camera. She loves ringing her NRGY cowbell. She has no problem yelling loudly to cheer us on. When we are done training and competing the Diva heals our minds and bodies. She makes sure the foundation is rebuilt enabling us to push our limits further. Her tireless and self-less contributions to Team NRGY provide us all a stronger foundation from which to build. As a part of this club and the Team NRGY community, her nurturing spirit is ever-present. She acknowledges every single accomplishment, every personal challenge and every Facebook Birthday. She is clearly more than our team masseuse. She is our sister, mother, counselor and friend. Her passion and love for Team NRGY enables each of us to excel and achieve our personal goals. We proudly present the 2012 Foundation Award, to the one and only, DIVA, Ms Charesse Foye. This award holds great meaning to me, because without these individuals we would not be the multi-sport athletes we are today. Each of us have our own personal rock which enables us to compete. The individuals Team NRGY has honored with the foundation award not only sacrifice for their loved one, but selflessly support each of us. This year’s award brings together a wonderful year in my life. I have so many reasons to be happy and so many things to be thankful for. Tonight is another awesome moment in the journey of life for me. We have all been enriched by the 2013 Inspiration Award winner, Tracey Santarcangelo.How appropriate I met Tracey in a bike shop - the kicker - she did not have bike. I think Tracey had heard of triathlon - but certainly did not know the difference between and Olympic and an Ironman. How the times change - she is an amazing and well-informed ambassador for Team NRGY. 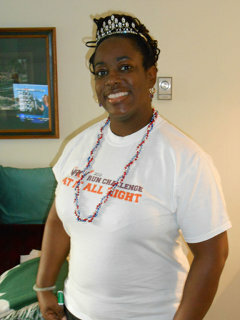 Yes, she married the founder, however, Tracey has willing given 110% to every to Team NRGY event and member. In just the past calendar year - Tracey ran her first half-marathon at Disney - then got up the next morning (it was the middle of the night) to support Jessica (and me) in Jessica’s pursuit of a marathon PR, which she achieved. 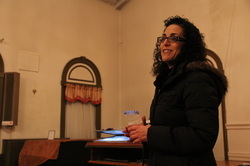 Tracey’s indispensable support made it possible. She drove us to the race start, raced through the Disney complex to get us nutrition twice and then was there at the finish to cheer us on. We should all be so lucky. Along with other Team NRGY members Tracey competed Lake Mohawk 8.2 miler. Immediately after she hosted us all for an after party at her parents home. An early Saturday morning car ride with Jemila was in order for a trip to Ironman Lake Placid. Tracey pitched right in at Stephen’s home, immediately organizing medical volunteer information and made sure we all got lunch. On Sunday cheered all day and volunteered in “Team NRGY” Medical Triage Unit directed by Kathleen Santarcangelo, R.N. until midnight. Her energy was boundless. It was Tracey’s suggestion that we ask Steven Richardson to fly us up to Ironman Mount Tremblant to support - Jessica, Tony, Greg and Scott. Mind you Tracey is not a fan of small planes. I know Tracey’s presence made a difference all of Team NRGY’s performance. 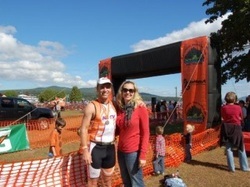 Tracey was at Lake George both days passionately holding down the Team NRGY tent at the hot corner. If that was not enough - she was out in the cold on Thanksgiving to set-up the Tent at Ashenfelter before she ran. She has been involved in the planning of this dinner. Tracey is my rock. I can confidently say that Tracey has enriched each of our multi-sport lives allowing us to excel. Without further ado, Tracey Santarcangelo, please come forward to accept the 2013 Foundation Award. The foundation award is presently annually to a non-competing member(s) of Team NRGY to recognize tireless and selfless contributions to Team NRGY. Their support, energy and passion provides significant impact on Team NRGY and enables their loved one and all members of the team to excel and achieve their personal goals. This award holds great meaning to me, because without these individuals we would not be the multi-sport athletes we are today. In preparing to present this year’s foundation award, I took a look back at the previous winners of this award, at the folks who enriched our lives. A common theme struck me. They all worked quietly in the background – supporting, caring and uplifting the members of Team NRGY. This year’s recipient is no different. For the past two years, this individual has selflessly offered support, advice, guidance and an ever-ready warm-caring smile. Little did any member of Team NRGY know that on February 3, 2012, when this year’s foundation award winner, Lisa Reavlin, walked into Meredith Cozzarelli’s home for the All Night Run – that in just two short years, Lisa would exemplify the Foundation Award legacy. In 2012, Lisa was a “gym rat,” clearly involved in fitness. However, at that point in her life, she had never even competed in a distance run. Today, Lisa sits here having completed three world marathon majors – Chicago and New York, three weeks apart in 2013 and Berlin in 2014. As much as we taught Lisa about endurance supports, Lisa has taught us about perseverance, dedication and determination. While learning more about endurance sports, Lisa always provided every new member with a warm-welcoming email. Lisa would brave the elements to come support Team NRGY Members at races and offer a high-five before, during and after the competition. 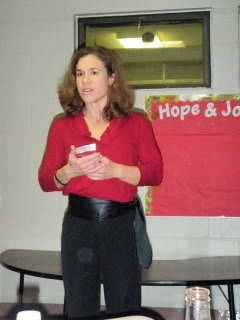 Lisa openly shared her experiences learning about endurance sports – something each of us benefited from. 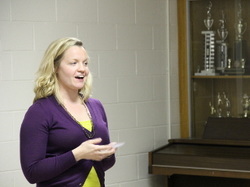 Lisa also assisted in educating Team NRGY about the importance of endurance sports nutrition in her position as Marketing Director for Powerbar. Lisa made sure Team NRGY always had an opportunity to sample a new product, ask questions and learn how to be properly fueled. Lisa always acted with a smile. Lisa’s dedication to Team NRGY is amazing. She has flown back from a new job in Los Angeles to join us here this evening… so I think she wins the furthest traveled award. Lisa – you embody the spirit of the Team NRGY foundation award. You have made a significant impact on Team NRGY allowing each of us to excel. I am honored to present the Foundation Award to you this evening.